Get ready – this Saturday, 6 October marks 24-Hour Comics Day, an annual international celebration of comics that challenges writers and illustrators to create a 24-page comic book story, normally months of work, in 24 straight hours. 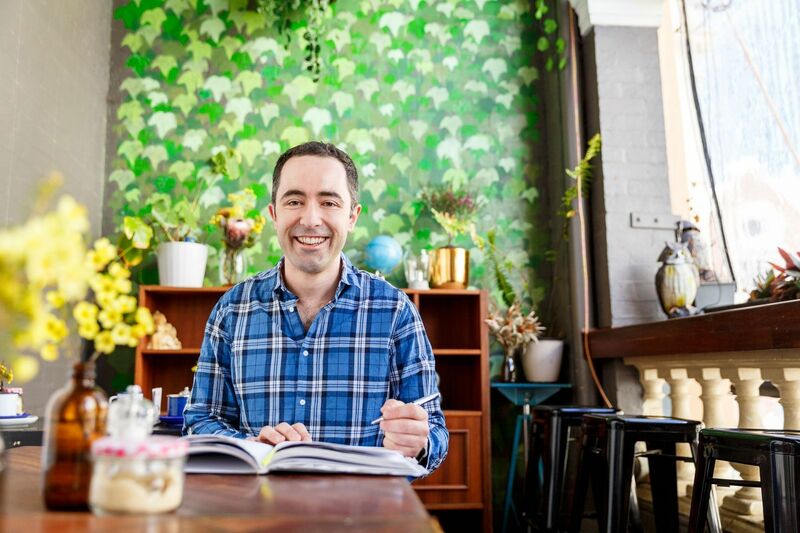 Lucky Sydney-siders can meet award-winning children’s author James Foley in bookstores, where he’ll teach kids how to create their own comic creations while launching his much-anticipated latest comic book, the fabulous Gastronauts. Foley, who lives in WA, is the renowned author and illustrator of the brilliant S.Tinker Inc series of junior graphic novels, including Brobot, Dungzilla and now, Gastronauts, says comics are the perfect medium to inspire newly independent readers and encourage reluctant young readers to pick up a book. ‘Comics are not mindless entertainment – they stretch the mind,’ says Foley. ‘It’s not all about superheroes, fights and explosions either. In fact, comics are a complex form of visual narrative that can be used to tell all sorts of stories, for children as well as adults.’ Foley, who works in the cluttered spare room at his Fremantle home, with his dog at his feet, believes pictures helps young readers learn new words and decipher their meaning within a visual context. James Foley will host fun comic book workshops at Better Read Than Dead in Newtown, Berkelouw Books in Leichhardt, Harry Hartog in North Ryde and The Children’s Bookshop in Beecroft from 6 to 8 October. 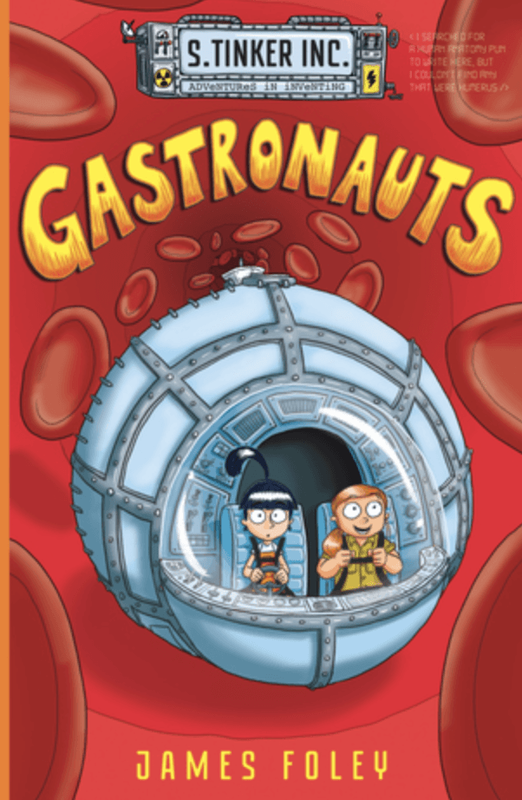 Gastronauts will be launched at The Children’s Bookshop on Monday 8 October. Tickets can be secured by contacting the booksellers. James Foley is a children’s author and illustrator whose books include In the Lion, My Dead Bunny, The Last Viking and The Last Viking Returns. Gastronauts is the third in the S.Tinker Inc. series. Where did you get the idea for this one? In the second book (Dungzilla), Sally invented a growth/shrink ray, capable of making things very very large or very very small. That book focused on making things very large, so I wanted to do another book that focused on making things small. There have been a few versions of the ‘journey into the human body’ story over the years – it’s a sci-fi staple – so I thought it would be fun to do my own spin on it. Plus, I’ve always been fascinated by human biology. Out of writing and illustrating, is there one you prefer? Or do you find them both easy to do? I like both, which is why I like to write and illustrate my own stories. Plus, in a graphic novel or comic book, the writing and illustrating are very closely intertwined; they’re hard to separate as they’re part of the same process. I start with a draft script that is only words, but then when I start sketching out the story, the words and the plot can change, and I end up rewriting the story as I illustrate it. Why did you choose the graphic novel format for your books? Before I started the S.Tinker Inc. series, I’d mostly illustrated picture books written for a pre-primary audience. But when I wrote the first S.Tinker Inc. story I realised it didn’t fit into a picture book format; it needed to be longer and to have more pictures. It also seemed to be more appropriate for an older audience. The stories might have worked as illustrated novels, but being such a huge fan of comics – and always having wanted to make my own – I decided the S.Tinker Inc. series was the perfect way to start. I’ve always seen my stories as movies in my head, and graphic novels are the next closest thing – they’re movies on a page. I read a lot of comics and graphic novels! I used to collect paperbacks but I’m trying to save money and bookshelf space, so now I buy digital editions to read on my iPad. I also read a bit of sci-fi – I’ve read most of China Miéville’s books – and a bit of thriller and action, so I always get the latest Matthew Reilly blockbuster. I enjoy Alan Carter’s crime novels and I need to get David Whish-Wilson’s new one, The Coves. Quite often, though, I watch TV and film to wind down; I find visual storytelling most interesting. I’m a huge fan of the Marvel films, and I also love Westworld, The Expanseand kids’ animation. Where do you live? Do you think there’s a strong creative vibe there? I grew up around Freo and still live in the area. There’s definitely a strong creative vibe, particularly for our local children’s book industry. We have The Literature Centre here. Fremantle Press is here. Lots of the local writers and illustrators live nearby. My best creative buddies all live in the same suburb. I’m so incredibly lucky to have grown up here with such a supportive creative community. What’s been your favourite thing about being an author? My favourite thing about being an author is getting to share my stories with kids. Getting to see their reactions first-hand is very gratifying; to hear that kids are enjoying your stories is a brilliant reward. I work from home in a spare room, surrounded by books, boxes, pin-up boards, art supplies and my dog. She’s usually asleep under the desk, unless it’s getting close to dinner time – in which case she nudges me until I step away from the computer. What’s next for you? Do you have any upcoming projects? I’m working on some new picture book ideas, the fourth and fifth S.Tinker Inc. graphic novels, and a big graphic novel project that will take a bit of time to develop. I’ve also just finished illustrating an anthology of funny short stories called Total Quack Up, which will raise funds for Dymocks Children’s Charities.